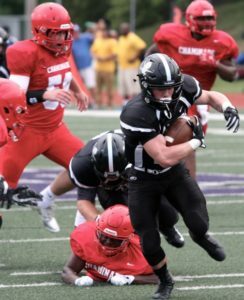 Jim Powers of HighSchoolSportsCaravan.com calls this weekend his “Christmas Eve.” The start of the 2016 Missouri high school football season kicks off tonight with a sense of urgency for teams. With the playoff system in place, teams are rewarded for playing tougher non-conference schedules and Powers said athletic directors and head coaches have really stepped it up this season. For the fan, that means more exciting games right out the gate. Powers says there is a lot of parity in Class 6. CBC lost a lot from their state-runner team from a year ago and will be led by a Gabbert at quarterback. The youngest of the three, sophomore Brett Gabbert. Powers says on the western side of the state, keep an eye out for Blue Springs. The other interesting story that Powers says to watch for early in the season is in Class 4 with Webb City. Their run for a sixth-straight state title came to an end when they fumbled on the goalline against Kearney. Powers wonders how Webb City will handle the loss, especially with teams like Carl Junction and Carthage coming after them this season? Powers is an analyst for football and basketball championships and he is also on the 14-person panel that develops the weekly football rankings, which you can find below.